Family Table Tennis: are you ready to take on your family in a friendly game of table tennis? It's time for some good old family fun, and what's more fun than table tennis? Just like a real family, choose your character from a cast of four, which includes Daddy, Mommy, Sarah and Billy. There are four table tennis-tastic stages where it doesn't matter if you're an indoors or outdoors table-tennis player. Pick your poison from a gymnasium, a forest park, a beach or even an amusement park. Choose from Single or Versus mode, or select a minigame to play. In Versus mode, you and a friend can play against each other to see who is the better table-tennis player. And if Single and Versus modes aren't enough, select between three minigames, which include Target Table Tennis, Thrilling Table Tennis and Matching Table Tennis. The appealing cell-shaded graphics and endearing music, on top of the super-fun game play, will have you and your family playing from morning till night. Get your paddles ready. 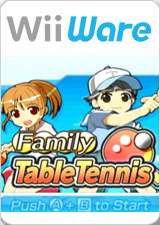 The graph below charts the compatibility with Family Table Tennis since Dolphin's 2.0 release, listing revisions only where a compatibility change occurred. This page was last edited on 16 January 2018, at 06:18.